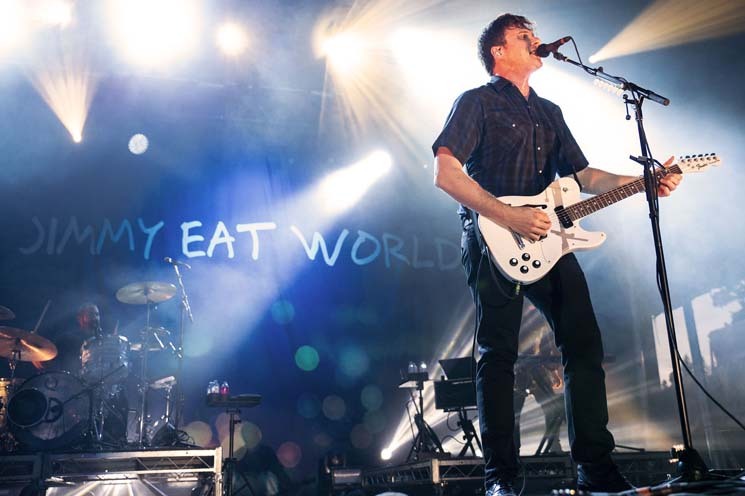 Jimmy Eat World carved out their own centre in pop culture. They're not quite a nostalgia act, since they're still releasing albums and songs that chart, but their most ubiquitous songs date back to the early '00s. They're not quite a straight-ahead rock act, yet they're not emo punks either. People of a certain vintage understand the sonic era Jimmy Eat World came out of but teenagers hearing the first few notes of "Bleed American" involuntarily sing right along. They exist somewhere on the edge of the middle ground of culture. "Sure and Certain" started off their Sonic Field Day set, and perfectly matched the veteran band's poise. A little later in the set, "Get Right" went wrong and had to be restarted, but lead vocalist and guitarist Jim Adkins made the light of the miss-start, telling the crowd they'd all been privy to "a real moment" amidst a set calculated to please anyone following along with Jimmy Eat World's career. Adkins strikes a compelling figure on stage, animated and seemingly ageless since 1999. He wears his belt buckle on his hip rather than in the middle also, presumably so that the back of his signature model telecaster guitar remains un-gouged. Jimmy Eat World have made smart investments through their 25-year career; sunscreen or some secret to not aging, fractal axe-fx guitar rigs, and soundtrack licensing agents, the latter ensuring that their songs show up in movie and TV soundtracks every few years to keep them entrenched in pop culture. The band's prescience is impressive. It took some time for the band to get to "The Middle," closing their set with their biggest hit song, which had every person in the audience singing along with the chorus. Everything was fine, everything was all right.